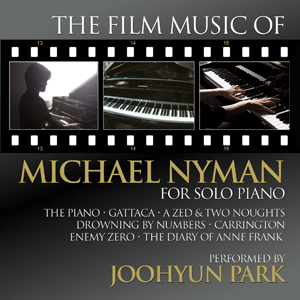 BuySoundtrax Records is proud to announce the release of The Film Music of Michael Nyman For Solo Piano featuring piano performances by Joohyun Park. The recording will be available digitally, in stores, and from www.buysoundtrax.com on April 10th. Pianist Joohyun Park was born in Kwang-Ju, South Korea. She began studying music at age 6. Park received both a Bachelor’s and Master’s Degrees of Piano from Yon Sei Univeristy (Seoul, Korea) and a Bachelor’s Degree of Contemporary Writing and Production from Boston’s famed Berklee College of Music. She has worked as a score coordinator, pianist, orchestrator and assistant composer for movies including Priest, The Informers, Drag Me To Hell, Creation, When in Rome, The Black Tulip, and Love Happens. A frequent performer for BuySoundtrax, Joohyun also performed The Music of Battlestar Galactica for Solo Piano. 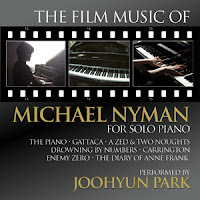 4/5 It is difficult to review a release like this one... the artist Joohyun Park does an awesome job giving the sense of Michael Nyman collective work. It's Joohyun Park could stand out and give us the same incredible return on personal material and journeys.